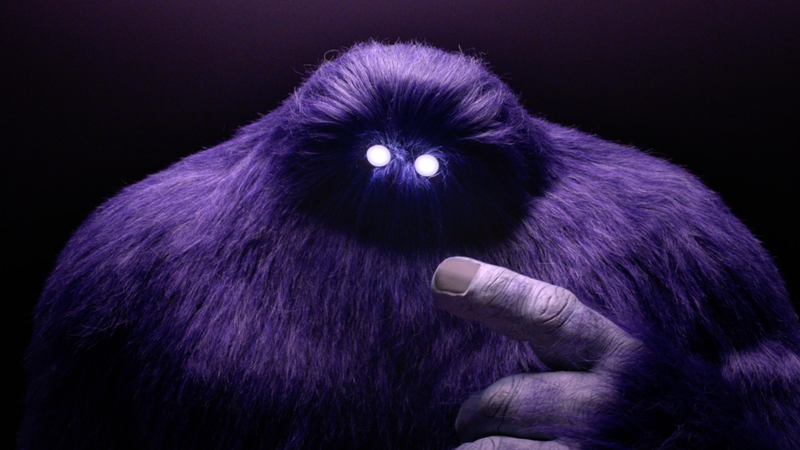 Working with mcgarrybowen, Harold Einstein and Outsider, The Mill helped to create this humourous spot for the job searching site, monster.com, featuring a large purple monster. The spot sees a large, purple fury creature lit up in a dark space via a spotlight as a deep male voiceover playfully explains that the way the site knows what jobs people are meant for is, of course, through telepathy. The friendly monster then goes on to doubt this reason for a moment before returning to the idea that telepathy is in fact the way the job site works, a hyperbolic but non the less entertaining concept to let users know the efficiency of the site in getting people jobs. The spot is largely shot in-camera, with The Mill's VFX team removing all signs of the monster puppet to ensure the audience's focused remained sharply on the purple creature. They also helped to animate the eyes, again to draw viewers in, as well as seamlessly compositing each shot together to allow the voiceover monologue to flow. Mill Head of Colour Seamus O'Kane graded the piece.